You can purchase the complete Kids' Wings 27-page Unit for The Perfect Wizard by Jane Yolen and The Uglified Ducky by Willy Claflin NOW! Available for immediate download for only $17.95! The Emeror's New Suit--Dress Him! The Perfect Wizard: Hans Christian Andersen is included in the Kids Wings Tempests and Teamwork Collection of literature guides for award-winning novels and intermediate-level picture books. Our Tempests and Teamwork package includes a site license for one school, a spiral bound book, and CD containing 29 titles with over 700 pages of activities, nine "Jeopardy-type" games, Karoke-type songs, and professionally recorded songs! 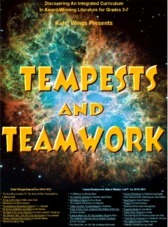 You can purchase a literature guide individually for around $16.95, but if you order Tempests and Teamwork, you can get 29 literature guides for only $20, or less than $1 each! This is probably the greatest bargain in the USA, as long as quantities last! by Marion Dane Bauer NOW!